At Innovation Day, exhibited CORNET projects are always well-attended. The project participants are happy to pass on their experiences to those who are interested in implementing an international research project. 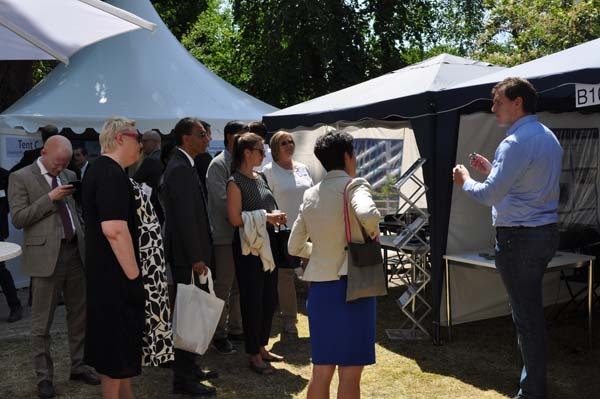 As part of the Innovation Day for SMEs in Berlin on 9 May 2019, hosted by the German Federal Ministry for Economic Affairs and Energy (BMWi), a few selected successfully running CORNET and IraSME projects will be presented to a large number of fair visitors. The projects can be found in the “International Area”, where the two transnational funding networks CORNET and IraSME organise a diverse programme with many highlights and a special focus on Austria as official “Guest country”. The German-Austrian project crew from “SurfParquet” will give insights into their research regarding structured surfaces for wooden floors with optimal resistance to building chemicals. Building chemistry primarily deals with the chemical and physical properties of building materials, such as the chemical reaction when cement hardens into concrete. The aim of the project is the development of novel structured surface coatings for parquets as well as the improvement of the resistance of parquets to building chemicals. Furthermore, it is intended to develop a test method for the assessment of chemical resistance and to gain insights regarding the renovation of structured parquet. “CARACOAT”, another successfully running German-Austrian CORNET project, deals with innovative coatings for molds and tools in the plastic processing industry. The development of new coatings with anti-adhesive and anti-corrosive properties is paramount in this project. The new coatings can be applied in relatively simple processes. For users in the plastics industry, this innovative technology offers numerous advantages, such as reduced mold contamination, resulting in extended service intervals, increased tool life and reduced wear. The third project “NoErgot” relates to the food industry sector. The German-Polish project crew focuses on the development of a harmonised method for testing the resistance of rye to ergot and to minimise alkaloid contamination. Because of the strict EU threshold levels, ergot-free rye grain has a high economic impact for farmers, but also for breeding companies that have to offer less susceptible cultivars. A harmonised ergot infection test will be an important tool to guide the breeding process into a more sustainable direction.